There will be free DNA consultations with Dr Maurice Gleeson on Friday 19th August from 1pm to 6pm at the Scouts' Hall, Nenagh, so do come along and get your DNA tested. This is open to everyone and not just attendees at the Gathering itself. People wishing to stay for the evening lecture from Danny Grace (entry fee: 10 euro) are more than welcome to do so. For those attending the Gathering, free DNA consultations will also be available on Saturday 20th August during the lunch and coffee breaks. the Family Finder test (also known as autosomal or atDNA, and is usually $99) is now only $69 - this particular test has never been so cheap so now is the best time to buy it. $69 works out at about 62 euro. the Y-DNA-37 test (usually $169) is now only $129, which is about 115 euro. the mtDNAplus test is also $69, about 62 euro. DNA is a great way of finding out more about yourself and where you come from. And it can really help you break through Brick Walls in your Family Tree. Here is a description of these tests and what they can do for you. How many types of DNA test are there? 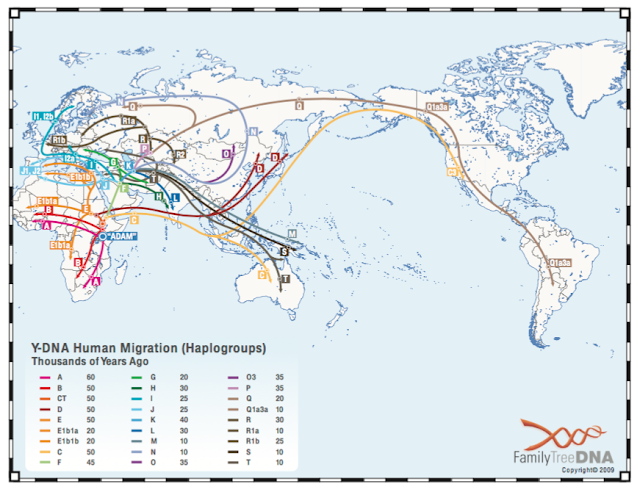 and atDNA (autosomal) traces ALL your ancestral lines and gives you your ethnic makeup. Note that Y-DNA and mtDNA will only give you information about one ancestral line each, whereas atDNA gives you information on all your ancestral lines (but only has a reach of about 300 years, compared to 200,000 years with the other two types of test). You may wish to look at this YouTube video explaining the three types of test in more detail and giving examples of their application to genealogy. How do I find out about my ethnic origins? 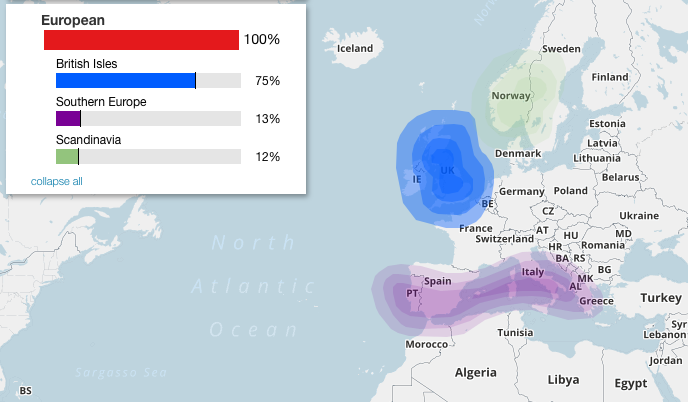 The Family Finder test (atDNA) will tell you roughly what percentage of your DNA is from Europe, Asia, Africa, etc. It will also give you rough estimates on a sub-regional level (e.g. "Central Europe" or "France/Germany") but is unlikely to identify a particular country. If you have 100% Irish ancestry, it will simply indicate a big blue blob over Ireland & Britain. But if you have ancestry from Europe, this should show up as one of several possible blobs on the map of Europe. This ethnic admixture test (also known as biogeographical analysis) will continue to be refined over time so your results will be updated periodically. And it makes for a pretty picture which the kids can print out and take to school. Because both Y-DNA and mtDNA only give us information about a single ancestral line (father's father's father's line or mother's mother's mother's line), they will only tell you where that one particular ancestral line originated (eg Western Europe, Africa, etc). And because both go back about 200,000 years to Africa, they will also give you the crude migration routes those particular ancestors took. More nice pictures for the kids school projects. How do I find out more about my surname and where it came from? Do the Y-DNA-37 test. 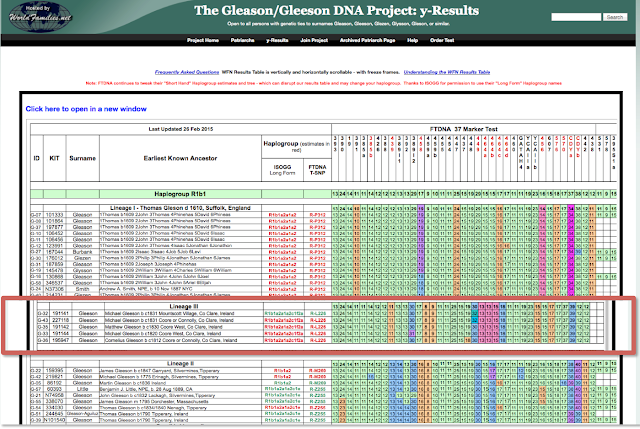 If you are a Gleeson, join the Gleason/Gleeson Surname Project at FTDNA and I will be able to give you a personalised report on your results. There are currently four main genetic groups in the project and we are expecting a whole lot more, but we need more people to test to find this out. So if you are a Gleeson, please get tested! Because women don't have a Y-chromosome, this test can only be done on men. So if you are a woman you will have to test a male relative. Your Y-DNA should be exactly the same as your father's Y-DNA and your grandfathers, etc all the way back on the direct male line ... unless there has been an NPE along the way. NPE stands for Non-Paternity Event or Not the Parent Expected. Common causes are surname change (for legal reasons), secret adoptions, and infidelity & illegitimacy (which were not recognised concepts under Brehon Law, so they happened a lot). These occur in about 1% of cases per generation. Start off with the Y-DNA -37 test from FamilyTreeDNA and be sure to join any relevant surname or haplogroup projects. You can find these by doing a search for your name on the FamilyTreeDNA website and it will give you a selection of relevant projects for you to join. After reviewing the results of your Y-DNA-37 test, ask the Admins of projects you have joined for advice on what additional testing might be warranted. This could mean upgrading to 67 or 111 markers, or it could mean doing SNP marker testing. The Project Admins will advise. If you want to explore your mother's surname, test her brother. He is the one who inherited the Y-DNA that goes with that surname. You can research ANY surname in your family as long as you test the appropriate male cousin who bears that particular surname. Can you spot the route your Irish male ancestors took out of Africa 50,000 years ago? How do I connect with genetic cousins? Y-DNA will connect you with genetic cousins with whom you share the same surname. mtDNA will connect you with cousins on your mother’s mother’s mother’s line but this is the least useful of all 3 tests - because mtDNA mutates so slowly, even an exact match could mean a common ancestor several thousand years ago (rather than several hundred years ago in the case of Y-DNA). 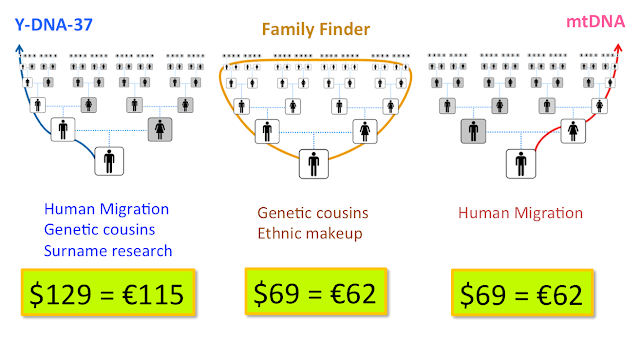 atDNA (Family Finder) will connect you with about 500-1000 cousins you never knew existed (if you have European ancestry). It gives you the most "bang for your buck". Most of them will be distant cousins, but you may spot a few familiar names in your list of matches. The majority will be unknown cousins who are related to you via unknown ancestors beyond your ancestral Brick Walls. You will have hours of fun trying to figure out how they are connected. Your father for example would be a generation further back than you, and thus he will have twice the number of matches on your paternal side of the family compared to you … because he has twice as much “DNA from the paternal side of the family” - each generation loses 50% of the DNA from that side of the family, because only half of it is passed on from parent to child. So your Dad would only have (roughly) 25% of his DNA from his grandfather, you would have only 12.5%, and your son would have only 6.25%. The percentage inherited from any one specific ancestor roughly halves with each generation. Testing yourself and a parent helps you isolate which side of the family your matches are from. So if you tested yourself and your Dad for example, any matches you both share in common have to be from his side of the family; and any matches that you have but he doesn’t, have to be from your mum’s side. Of course you could also test your mum to answer this same question, if she is still with us. FamilyTreeDNA store the DNA samples for 25 years free of charge so this serves as a genetic legacy for future generations - could be important as the science of genetic genealogy progresses (and it has only been around for 15 years or so). So come down to the Gathering and get tested!